Hello readers,Today in this post i have collected the list of top 10 programming languages in the world which are most popular at all time. 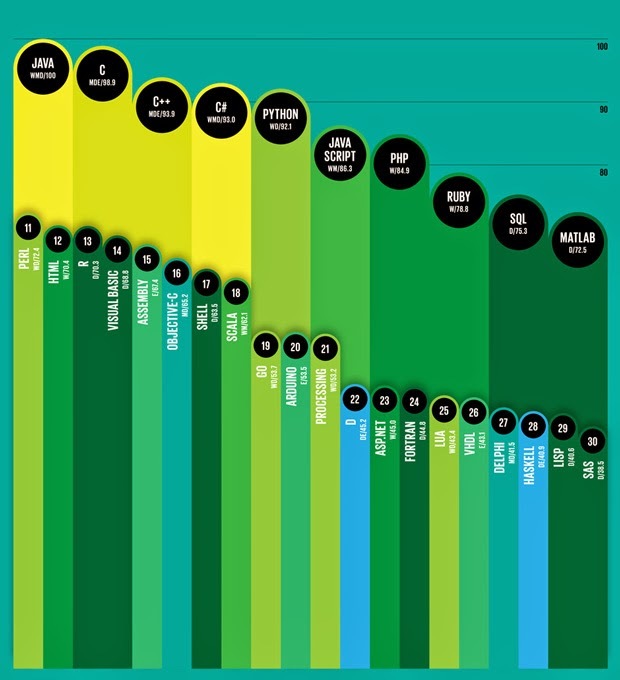 It is possible that you may not have heard about some programming language.But this is the all time most popular programming languages. I have collected Infographic from this site .Well in this list there are three various parts which contains List from 1 to 10 then 11 to 20 and then 21 to 30. So by this way you can get better idea that which language will be good for you in future. Catch this: List of top best resources to Learn programming online. Any guess about which programming language on the TOP position? Well it's JAVA . JAVA is all time favorite programming language in world. Well this List if useful to select the right language for programming carrier in future. I hope you all get better idea about top programming languages in the world.